When I first began my water adventures, I spent every weekend in the ocean snorkeling with my friend and future scuba diving buddy. We were like two alien beings hovering in the sky in their spaceships, looking down on an earth that we couldn’t truly be a part of. Only, our spaceships were 7mm wetsuits (cold Pacific water) and we were looking into the underwater world of the Cove. I attempted to dive into the depths but popped right back up like a cork, never able to go more than three feet below the surface. I knew I needed weights to get down there but I also knew that to be safe, I wanted to be weighted properly. I also realized that holding my breath for any period of time at any depth could cause a blackout and we lacked sufficient skills to handle such a situation. For those reasons, I had to wait to take a freediving class. Do you remember what is was like in Junior High when you had a crush on someone and all you could do was dream about what it was like to kiss them? Can you recall the longing you felt in the pit of your stomach? Do you remember what it was like when you got so close but the kiss never happened? For three of the longest months in my entire life, I felt this way about the water. I waited and I longed and I waited more to be able to kiss the water. When I felt I was ready to start taking steps toward a class, I spoke to someone who is an avid spear fisher about freediving. They told me to just get in the water and practice. I was stunned! Since I’d already heard about so many people drowning while spear fishing/freediving, I decided that the advice from this famed guy wasn’t something I should take. I walked away slightly disappointed and ever more determined to take a freediving class. 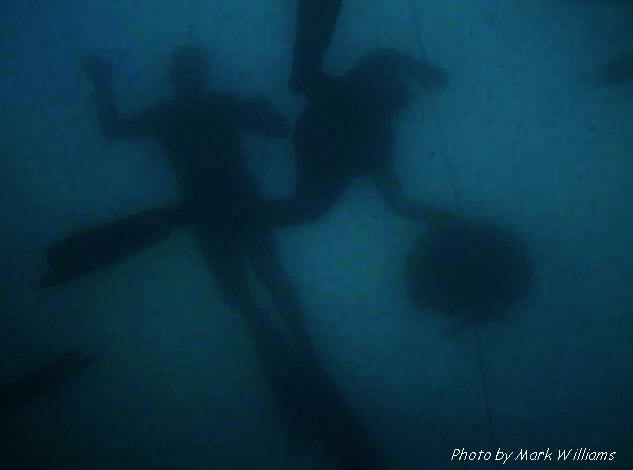 It didn’t take long and soon I was enrolled in a freediving course at a local dive shop. I was finally going to be able to go deeper! I remember the wonderful feeling of the weight belt snugly wrapped around my hips as I made my first ocean descent. The viz was horrible and the surge was moderate but I was diving. Finally, with my whole being, I was kissing the the big blue. The sensation was exhilarating! I soon found out that unlike a first kiss – which is so special because you never really feel that way again – freediving is that first kiss, over and over and over. Sometimes it’s perfect and sweet, calm and calculated. Other times it’s sloppy and eager. Short or long, it’s never long enough. And of course, it’s always wet. My path of freediving had just begun and I still feel that same passion 6 months later as I write this. I’m not sure if it will ever go away but I know that each day when I wake up, one of the first things I think of is how soon I’ll be back in the water, my whole being immersed in that wonderful wet kiss.